Do you want to add some color to your reef tank? Then look no further than the Orchid Dottyback (Pseudochromis Fridmani) which are sometimes referred to as Fridman’s Dottyback or Fridman’s Pseudochromis. These captivity breed saltwater fish add color and personality to any saltwater tank. Here is everything you’ll need to know before adding one of these stunning little fish to your tank. A saltwater tank of 35 Gallons minimum is needed with plenty of hiding places for when they feel threatened they can swim into and hide. When you first add these fish into your aquarium they will shy away and find a dark and secure hiding place. After a few days, they will start to emerge from their hole and venture out into open water. As they grow in confidence they will become form a strong personality and soon become one of your favorite fish in your tank. The Orchid Dottyfish need a strong water flow through the tank to simulate their conditions in the wild. Water conditions are similar to most other saltwater fish 72-78° F, dKH 8-12, pH 8.1-8.4, sg 1.020-1.025. Adding them to a mature saltwater reef tank is always best, they are hardy fish but we would suggest adding them once you have a steady and mature aquarium. Make sure you have a fitted lid or cover as these fish are expert jumpers especially when first added to the aquarium when they feel scared. You want to add two of the same species then we would suggest adding them at the same time. If you add a new Dottyback into a tank that already has a confident and mature Orchid Dottyback then they will probably fight over territory normally resulting in the death of one of them. They will live well with most fish but will prey on ornamental shrimps,fanworms, and bristleworms. We would also suggest not housing them with very small, shy or slow feeding fish. Once this fish settles into a tank they will dart around and feed fast with a little bit of aggression. 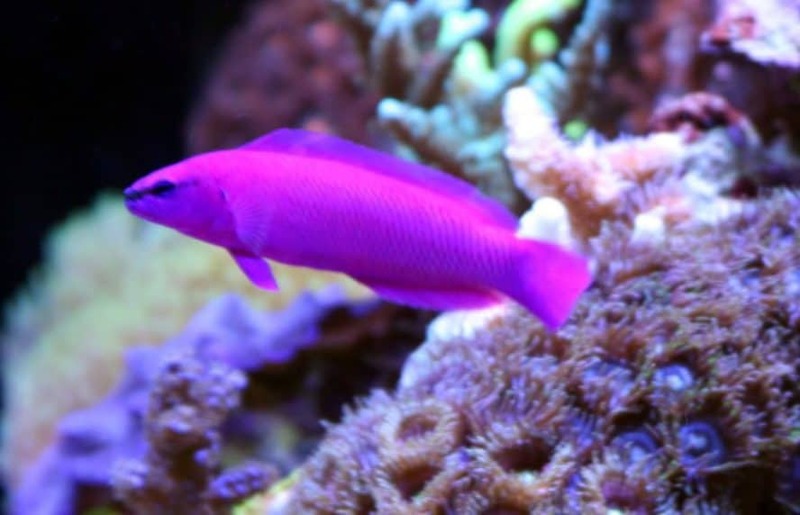 Most fish can handle this and they will not be concerned with the Orchid Dottyback fast pace and strong personality. These fish are often confused with the Strawberry Fish (Pseudochromis porphyreus), The two can be distinguished by the black stripe running across its head and over its eyes (vs. no black stripe in P. porphyreus). Good tankmates would be Larger angelfish, tangs, hawkfish, and large damselfish. Remember they don’t really get on well with other Dottyback fish. We would suggest you add these as one of the last fish into your established aquarium. If they are introduced first they will show aggression to new tank mates. These fish are perfectly fine to keep with corals and invertabrates and offer no threat to reef aquariums. To ensure these fish keep their amazing bright colors they will need a varied and nutritious diet to help maintain their wonderful colors. Once they are settled into your tank they will eat Flake Marine Food. However, in the early stages, you will need to provide Mysis Shrimp, Brine Shrimp, and other finely chopped meaty foods. Captive fish should be fed once or twice a day but wild fish should be fed small amounts 5-6 times a day. You will need to ensure that other fish get some of the food as these fish are fast at eating and will bully most other fish at feeding times. We use these foods available from Amazon dried Brine shrimp and Dries Mysis shrimp are perfect for your new Orchid Dottyback. Even better would be live food which is available in most aquarium stores. One thing you must never do is OVERFEED YOUR FISH this is the number one reason most fish tanks have water quality issues. Small and often is the key. Breeding Orchid Dottybacks in Captivity – Environment is key! This species has often bred in captivity and in the home aquarium, tank-raised specimens are sold alongside wild species. You’ll be surprised to learn there is not much difference in price between wild and captive bred. The male fish entices the female into spawning by performing a mating dance outside their home This is normally a cave or PVC pipe that you have provided for them to breed inside. If the female accepts the male’s advances, she will enter the chosen breeding area and deposit several hundred eggs, which are simultaneously fertilized by the male. 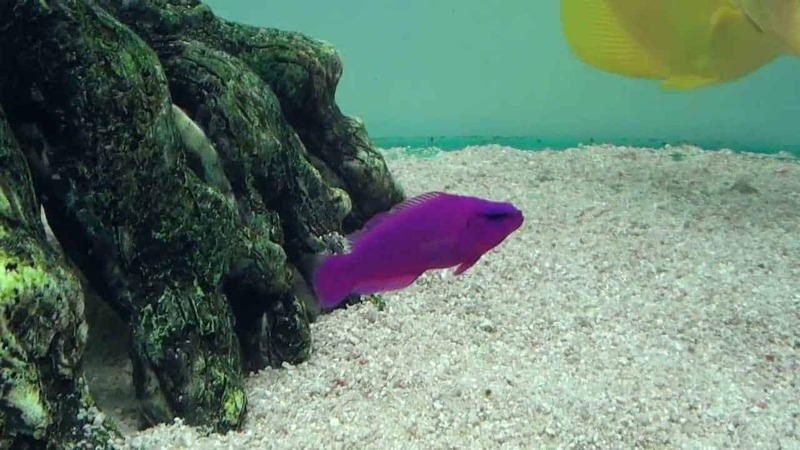 Provide plenty of rocks and hiding places for your Orchid Dottyback to breed. The male then chases the female away and he will take care of the eggs. He will gently fan them with his pectoral fins and pick them up and move them to a new location if he feels their egg are in danger. The eggs will hatch within 4-5 days and will remain in a larval state for around 24-28 days. When the eggs finally hatch the parents will start to ease off from caring for their young. You will need to separate the young from the parents and any other fish in the tank for their own good. Raising the young larvae to adult fish is very challenging due to their feeding requirements. The water quality is also very important for the young fry. but without doubt, feeding is the number one obstacle when trying to raise young Orchid Dottybacks. Whilst breeding these fish is easy for established industry breeders, in the home aquarium it’s still very hard to do, but not impossible. Let us know if you have successfully bred these fish in your aquarium. Orchid Dottybacks are part of the Pseudochromidae Family and can be found in and around the reefs in the red sea. This fish is up to 6-7 centimeters long. It lives in tropical marine waters up to 60 meters deep near reefs. It shelters in holes and reefs. Should I get a captive or wild bred Orchid Dottyback? These fish are often bred in captivity and are now widely available. Most good stores will have wild and captivity breed varieties of this fish. Both are hardy and will live comfortably in your home aquarium and are similar prices. 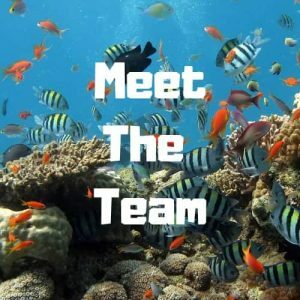 There are a number of other fish in this species which also work well in a home reef tank are: Purple Dottyback, Bicolor Dottyback, Neon Dottyback and Blue Eye Royal Dottyback. All make excellent reef fish, however, most don’t like living with other Dottyfish especially if added at different times. If you want to try add different varieties of Dottybacks then add them at the same time. 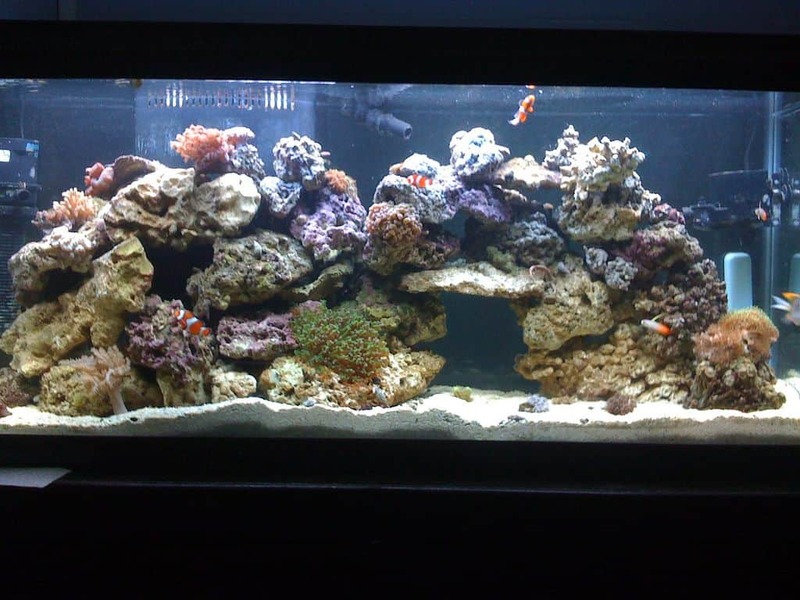 These fish are perfect inhabitant for any saltwater or reef tank. Remember to fit a secure lid on your tank when you first add them to the tank or they will jump out and you don’t want to wake up one morning to find your lovely fish dead on the floor. Have a look at other Dottyback species available and consider other brightly colored saltwater fish like Firefish Goby, Green Mandarin, and Tailspot blenny.